Nathan is pretty picky on his meals. He loves to eat on particular things like fried stuff (of course), pasta (his all time favourite), and things that he use to eat (BIG NO NO to new things, and that is the hardest thing). Furthermore, he doesn’t like to eat things given by strangers which is great, but if he is at preschool from 9 to 3 with an empty tummy (imagine that). 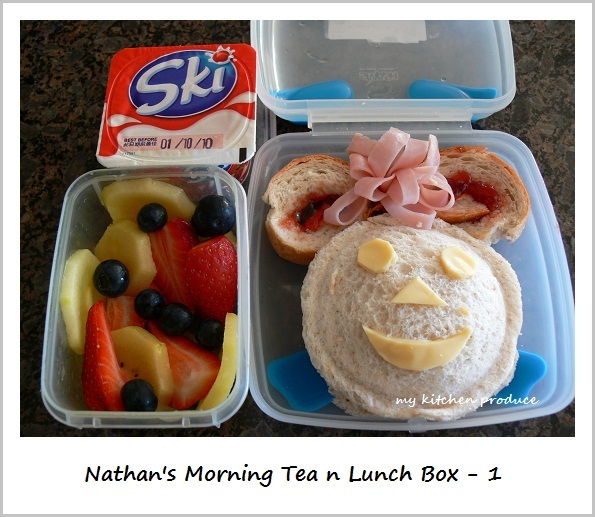 Almost every week he brought back all his morning tea and lunch. He barely touched the meals. All those things happened at the beginning of his preschool. Now, it is all depend on his mood and preferences. He finished his morning tea (yogurt and string cheese), but rarely finish his lunch. He has been in preschool since March, and I guess he has been blending in with his friends including on eating yogurt and banana (finally something positive that he picks up a t school). Before, we had to buy the grand version of yogurt, the squeeze version that comes in tube, they are much much more expensive. Now, he is totally fine with the standard tub packaging. Now I have no problem on changing his morning tea menu from yogurt and cheese or banana on rotation (mostly I gave him variety of yogurt flavours). I asked his teacher on what other kids brought to school for lunch. I thought I might prepare something similar so that he will eat as he watched others eat as well. It turned out that I gave him similar stuffs to what his friends had, like rice, pasta, noodle,and sandwich. The teacher said probably I should watch the portion as morning tea time is only one and a half hour difference from lunch time. I admit it that I usually gave him quite a lot but not as much as what he normally had at home (that was my argument to the teacher). Well I thought I gave it a try, reducing his portion and make his lunch much more eye catching, fun, and still healthy. Make an omelet. Using a round glass, cut them into 2 round shapes. Using pressure, cut ham and cheddar cheese using the glass. Now assemble them in these order, bread, ham, cheese, egg, tomato sauce spread, egg, cheese, ham and bread. Place a round glass on top of the bread and use a slight pressure to seal the sandwich. Flip them and do another pressure on the other side. Just remember do not press too hard as you cut the sandwich. As for the ears, use the leftover bread to make a round shape. Remember to spread some strawberry jam in between. Please leave your comment/suggestion if you find this recipe useful. Can’t wait to hear from you and Thank You !! !